Fish-and-water plant painting was a unique motif reflecting life of the Jiangnan region and was depicted by many unknown artisan painters. 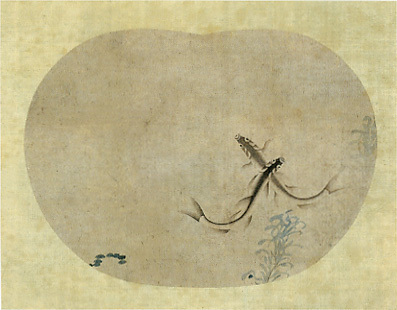 Fan Anren, a painter representative of the region, was invited to the Southern Song Imperial Academy during Emperor Lizong’s Baoyou reign period (1253–58) and was particularly skilled at painting swimming fish. This work is without any signature but it is attributed to Fan Anren. Fish and water plants are delicately outlined and colored by using broad-brush strokes.